Got the man socks done, though as I type this they're lingering in the laundry room waiting to be blocked. I think this is going to be another one of those years where my relatives in England get their Christmas presents in January. Still, handknit socks are welcome any time, right? Except if you're Pete. He was really impressed with how comfortable this particular pair of socks is - and really determined not to let me knit him some of his own. He is just not a fan of warm layers and won't let me knit him anything! I find this so weird. I mean, he looks so darned natural in these babies. Actually I think they're a little big on him, after all my worry about running out of yarn. 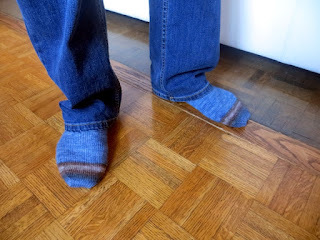 The man who's getting them instead has a wider foot, so with luck the extra length will go to make up width and work out all right in the end. Having these socks off my needles frees me up to knit the next pair of wool/mohair blend socks for Julia, so that will be nice. 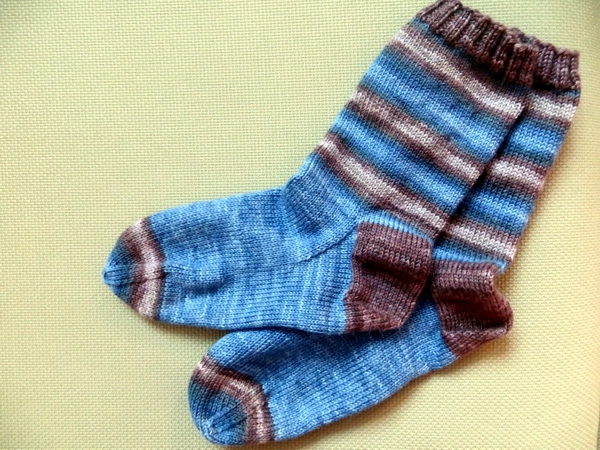 I'd like to cast on the next pair of man socks too, but I have to finish with one more stray sock before I have sufficient needles free for those. We snuck off to see Spectre tonight, so technically I should have had that one all the way to the toe, but who wants to knit during a new Bond film? You might miss some vital second from a car chase, or drop a stitch during an unexpected moment. (I didn't love this one, in case you're wondering. It seemed very grainy, visually, and though I was glad that most of the violent scenes were blurred, I could always predict when one was coming because the plot twists were so similar to those in earlier movies. Anyway: socks done, weekend knitting on the horizon. Fingers crossed for more complete items to come soon. And some fingers crossed for you as well - hope you get a great couple of days, and I'll see you next week!